Ethernet is everyone’s favorite networking technology. Its ubiquity and popularity have pushed it outside the LAN and across almost all aspects of network infrastructure. 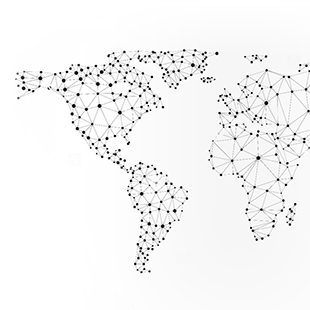 When we started looking for a way to naturally extend the Ethernet protocol to provide WAN connectivity back in the early 2000s, the industry introduced Carrier Ethernet. 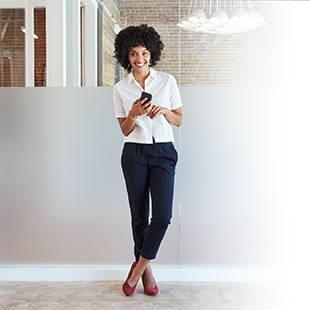 Don’t let the name fool you, though: it isn’t just for carriers—it’s an incredibly reliable and feature-rich solution perfect for all network operators who provide networking services to end-users. Read more about these two technologies in this post. 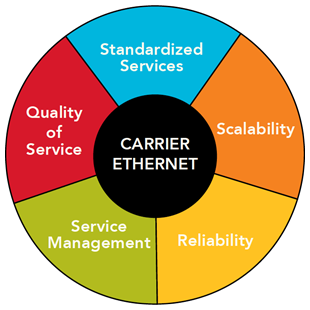 This is the second post in our Carrier Ethernet Essentials series. Take a look at the previous post, The History of Carrier Ethernet, to get a sense of where we are now. Okay, how many of us remember the party-line phone systems of the 1950s? Multiple houses shared a single telephone wire, which meant only one user could talk on the phone at a time. It was expensive to run a separate phone line to each home, so the party line system was the logical, cost-effective solution to providing sparsely populated rural areas with telephone service. Early iterations of Ethernet worked similarly to the party line system: a network device first tried to transmit data and then listened for a collision with other activity on a commonly shared network segment. If a collision was detected, the sender automatically waited a random time period (a millisecond or two), then checked again to see if the network was available to send data. Now, however, Ethernet is everyone’s favorite networking technology. The ubiquity and popularity of the technology has pushed it outside the LAN and across almost all aspects of network infrastructure. The old party line concept may work with 20 close neighbors, but not with 20,000, and that’s where the evolution of Ethernet into Carrier Ethernet begins. 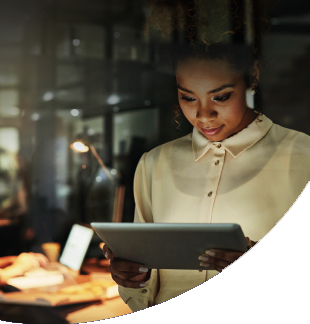 You can learn more about Carrier Ethernet essentials, services, and standards by downloading our eBook. Back in the early 2000s, when we started looking for a way to naturally extend the Ethernet protocol to provide Wide Area Network (WAN) connectivity, the industry introduced Carrier Ethernet (CE). Unsurprisingly, carriers appreciate CE because it enables a variety of network services that can be sold to both other carriers (wholesale) and end users (retail). However, it isn’t just for carriers—it’s a feature-rich solution perfect for all network operators (carriers, enterprises, and government) who provide networking services to end users, both internally and externally. As a WAN technology, CE is lower in cost and faster than legacy technologies like Asynchronous Transfer Mode (ATM), Synchronous Optical Network (SONET), and Frame Relay. CE also gives carriers and enterprises necessary management capabilities while plotting out a road map that will support increasing speeds over the next few years. A coalition of networking industry vendors and service providers, the MEF, developed a new set of standards principally for optical-based, metropolitan carrier CE used to connect enterprise LANs. 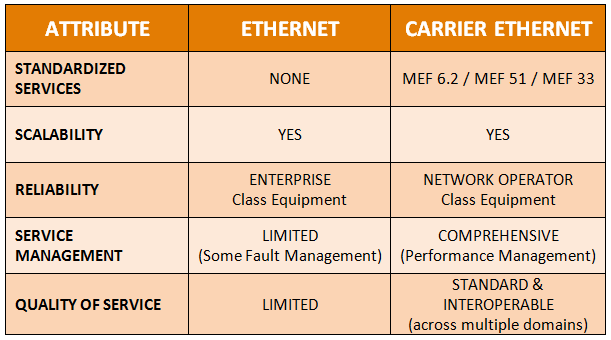 One of the MEF’s significant early accomplishments was to capture and formalize the vocabulary used when describing Ethernet services and attributes. Since then, the Forum’s key role has been to articulate the industry consensus on how CE services should behave, and the attributes necessary to build, deploy, and ultimately buy/sell them. As sister technologies, there are many similarities between Ethernet and what’s considered Carrier Ethernet—but there are several important differences, as well. Both operate under relatively low costs and have simple, easy-to-connect designs. Take a look at the varied aspects of each in the chart below. A key driver for Carrier Ethernet adoption is the push to reduce carrier networking costs by implementing converged networks that combine business, residential, and wireless traffic to create economies of scale. Any enterprise or other network operator can also realize substantial savings by converging corporate and carrier networks in the same way. Additionally, multi-domain service orchestration (MDSO) provides a solution to overcoming the limitation of traditional operating systems. 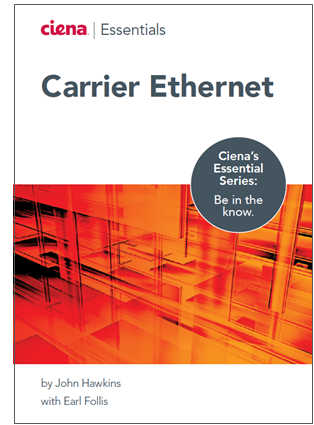 If you’re interested in learning more about Carrier Ethernet, download your free copy of the Carrier Ethernet Essentials eBook.